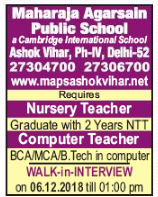 Maharaja Agarsain Public School, New Delhi has advertised for recruitment of Teachers jobs vacancies. Interested and eligible job aspirants are requested to walk-in on 06th December 2018. Check out further more details below. About School: MAHARAJA AGARSAIN PUBLIC SCHOOL, ASHOK VIHAR, DELHI is christened after the great saint Maharaja Agarsain who was the founder of the time-tested socialist democratic set-up as envisaged in the ancient civilization. The Agarwal Welfare Society, inspired by the high ideals of this great Saint of social justice, community service; complete dedication for humanitarian ventures, pioneered several social and charitable activities with a view to give back to society-MAPS being one amongst them. The school tirelessly endeavours to bring in the new processes in terms of technology & pedagogy , without compromising on its high ideals.